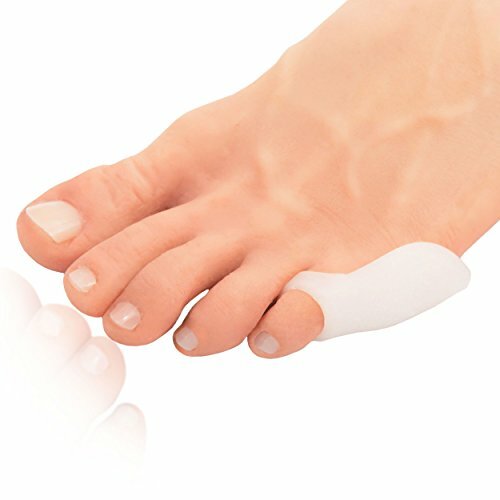 SET OF 4 TAILOR'S BUNION PADS: Get a total of 4 bunionette pads that will help relieve pressure on your tailor's bunion and prevent callus formation on your little toe. We like to give you spares in case you lose one! SOFT GEL PROTECTION: Our soft gel tailor's bunion cushion is super stretchy and secures easily around your 5th toe. Don't waste your time with bulky socks when you could just pop on a nice comfortable gel pad. WEAR WITH SHOES: Is there a pair of shoes that you've been dying to wear, but they just hurt your feet too much? Well, our bunions pads can be easily worn with shoes, because afterall that's when it hurts the most! AN IMPORTANT NOTE FROM HAPPY CUSTOMERS: These cushions work best with snug fitting socks & shoes, because it helps stop shifting and bunching of the pad. If you use them with loose shoes or heavy socks, try taping down the end of the shield with a band aid to keep it in place. GET BACK TO IT GUARANTEE: Your results are our top priority. It's part of who we are as physicians. So if your purchase doesn't help you get back to doing what you love, we'll find something that will or we'll give you your money back. That's our promise to help you Get Back to the Original You. YogaToes GEMS: Gel Toe Stretcher & Toe Separator - America’s Choice for Fighting Bunions, Hammer Toes, More!